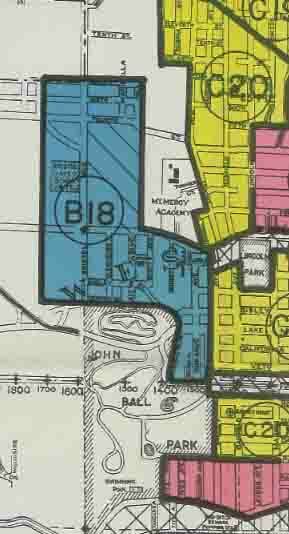 This small section of the Grand Rapids Residential Security Map from the Home Owner's Loan Corporation shows the grading by both letter and color; sections are graded by A,B,C, and D, and also represented by color from green, blue, yellow, and red, from most to least favorable neighborhoods. Find a link to the full map in the photo essay, Financial Crisis: GR Neighborhoods and the HOLC Map. National Archives - RG 195 - Federal Home Loan Bank System, Home Owners Loan Corporation Papers, Box 24.